Mesenchymal Stem Cells (MSCs), also known as Marrow Stromal Cells, are multipotent stem cells found in the stroma of non-hematopoietic bone marrow. MSCs have a large capacity for self-renewal while maintaining their multipotency . MSCs and MSC-like cells have now been isolated from various sites other than the bone marrow, including adipose tissue, amniotic fluid, periosteum, and fetal tissues, and show phenotypic heterogeneity. MSC-like cells have been isolated from pathological tissues such as the rheumatoid arthritic joint, and these cells express bone morphogenetic protein receptors. Indeed, it has been suggested that cells with mesenchymal stem characteristics reside in virtually all postnatal organs and tissues. In a steady state of cell turnover, or in response to trauma, MSCs are induced to differentiate into a wide array of cells types including osteoblasts, chondrocytes, myocytes, adipocytes, beta-pancreatic islet cells and possibly neuronal cells. Markers expressed by mesenchymal stem cells include CD105 (SH2), CD73 (SH3/4), CD44, CD90 (Thy-1), CD71 and Stro-1 as well as the adhesion molecules CD106, CD166, and CD29. Among negative markers for mesenchymal stem cells (not expressed) are hematopoietic markers CD45, CD34, CD14, CD11 and the costimulatory molecules CD80, CD86 and CD40 as well as the adhesion molecules CD31, CD18 and CD56. Endoglin, also known as CD105, is a type I integral transmembrane glycoprotein and is an accessory receptor for TGF-beta superfamily ligands. Endoglin is highly expressed on vascular endothelial cells, chondrocytes, and syncytiotrophoblasts of term placenta. It is also found on activated monocytes, mesenchymal stem cells and leukemic cells of lymphoid and myeloid lineages. CD73, an ecto-5’-nucleotidase, is a glycosyl phophatidylinositol-anchored ectoenzyme that forms a disulfide-linked homodimer. The 5’-nucleotidase activity of CD73 converts extracellular nucleoside 5’-monophosphates to nucleosides. It is one of several enzymes responsible for the production of extracellular adenosine, a signaling molecule that is involved in responses to inflammation and tissue injury. 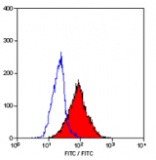 Most cell types express CD73. 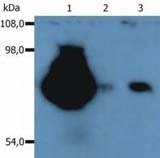 CD44 is an 80 to 250 kDa type I transmembrane glycoprotein that binds hyaluronan and a variety of extracellular as well as cell surface ligands. The molecule exists in multiple spliced forms and shows enormous variability in glycosylation. Human VCAM-1 (CD106), a member of the immunoglobulin superfamily, is a cell surface protein expressed by activated endothelial cells and certain leukocytes such as macrophages. VCAM-1 expression is induced by IL-1beta, IL-4, TNF-alpha and IFN-gamma. VCAM-1 binds to leukocyte integrins VLA-4 and Integrin alpha 4 beta 7. Activated leukocyte cell adhesion molecule (ALCAM) is a type I membrane glycoprotein that is a member of the immunoglobulin superfamily. It is also known as CD166, MEMD, SC-1/DM-GRASP/BEN in the chicken, and KG-CAM in the rat. 79 products - FILTER YOUR RESULTS!